LASSIE is a lovely black female who has a white chest patch and a few white socks. She is a strong looking joyful girl who loves people. 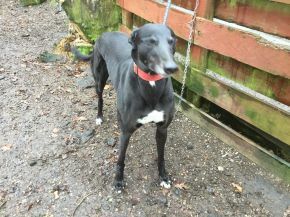 She has lived in a home before, is housetrained and she is a clean girl in her kennel. She could do with a little extra lead training but she walks really well on a short lead and just loves being outdoors and takes in all the sights and smells around her. She is very affectionate and adores being stroked and groomed and will snuggle up in her basket to wait her turn. If you’re looking for a dog who is confident and joyful, look no further than Lassie. She’s a fantastic girl.